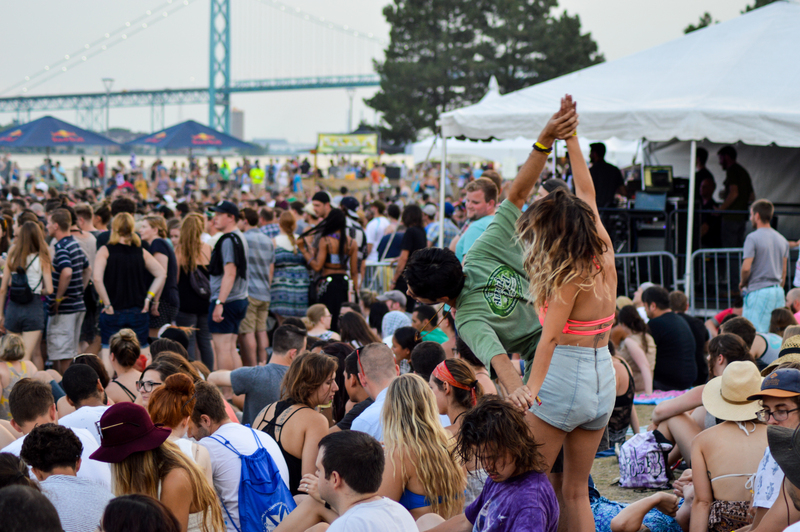 This was the first year that Mo-Pop was located in downtown Detroit, Michigan alongside the Detroit River. 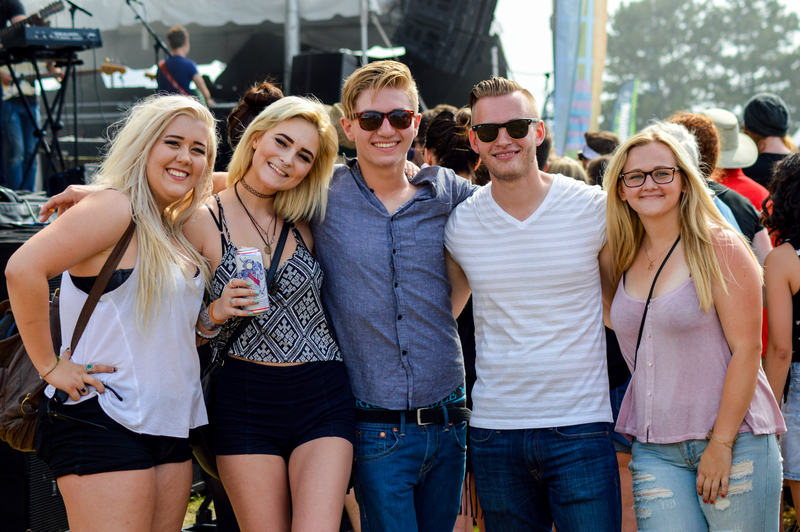 The 2015 festival included 24 indie artists that played on two stages as well as a craft tent, a beer garden, a tech showcase, and an array of food trucks to feed attendees. 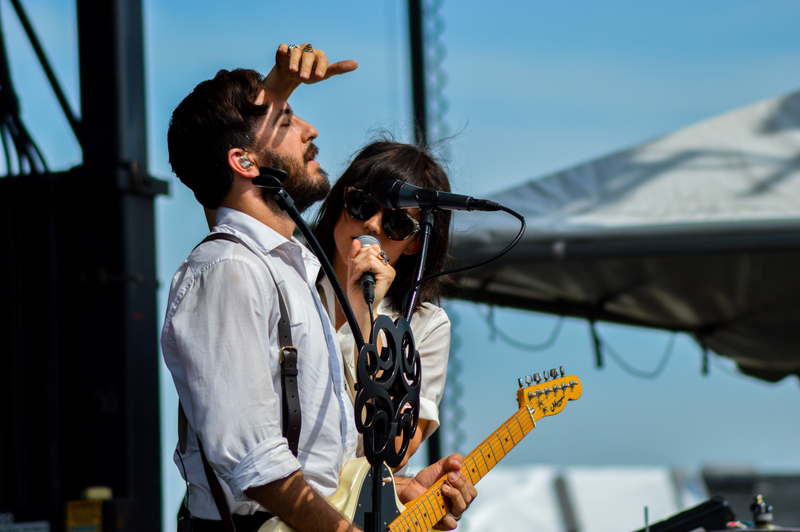 This new location brought a host of difficult surprises, but Mo-Pop proved to be a very well executed music festival that offers more than just music to attendees. With roughly 7,000 festival attendees it is definitely a small festival which makes for a unique experience. The new location had me concerned about population control and ease of navigation throughout the city however, those concerns quickly dissipated as soon as I walked into the Mo-Pop festival grounds. From the very beginning Mo-Pop presents a smooth and enjoyable experience suitable for all ages. Entering a festival often makes me feel like I’m being herded like cattle through a field, but Mo-Pop did a fantastic job of making the entrance a swift and welcoming process. Simply present your ticket to one staff member and open any bags for another staff member to search. I was through the gates and enjoying the festival within 10 seconds. The best aspect of the West Riverfront location is obviously the Riverfront! 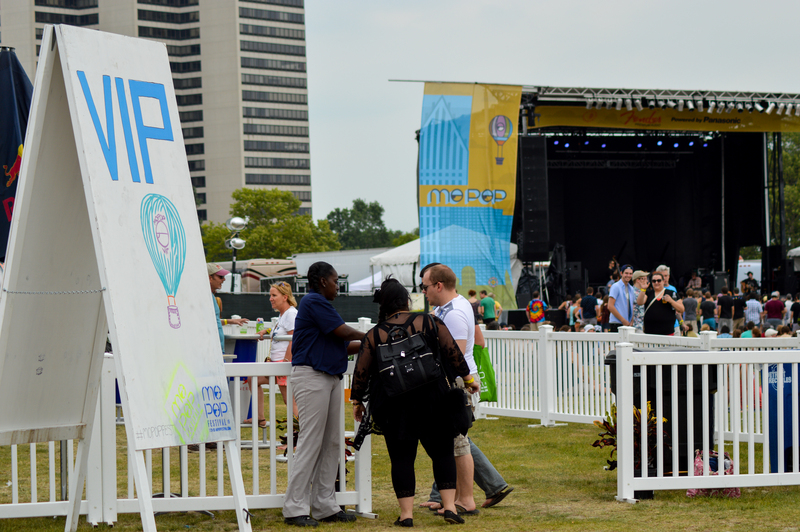 Mo-pop actually included part of the Detroit RiverWalk in its festival grounds which made for amazing views of the Detroit River. 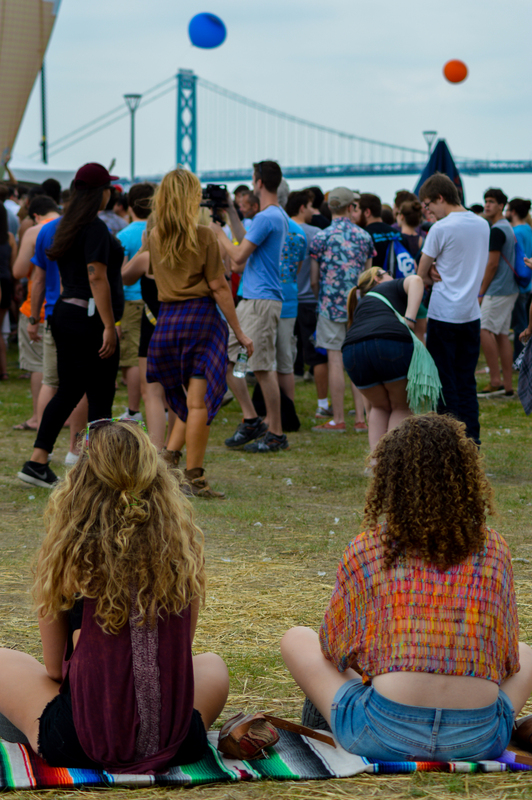 Hundreds of people lined the rails along the walk way to catch a breeze and take a break from festival activities. Day and Night the walk way provided a beautiful view of the Ambassidor Bridge which connects the United States and Canada. Throughout the weekend boats would even park alongside the festival and people could enjoy music from the luxury of their yacht. The Detroit city skyline also made for a unique view behind the Fender stage as the downtown skyscrapers provided the perfect backdrop for performers. I really appreciate a good view and I think it makes the whole experience well rounded and unforgettable. Saturday night it stormed and it stormed HARD!! Many fans ignored the rain and continued to support Iron & Wine until lightning neared the vicinity. At this point festival attendees were prompted to return to their cars to wait out the storm but many stayed at sought shelter in the many tents setup around the festival grounds. When the rain finally stopped, the sun came out and illuminated a vibrant rainbow that stretched across the Detroit River. 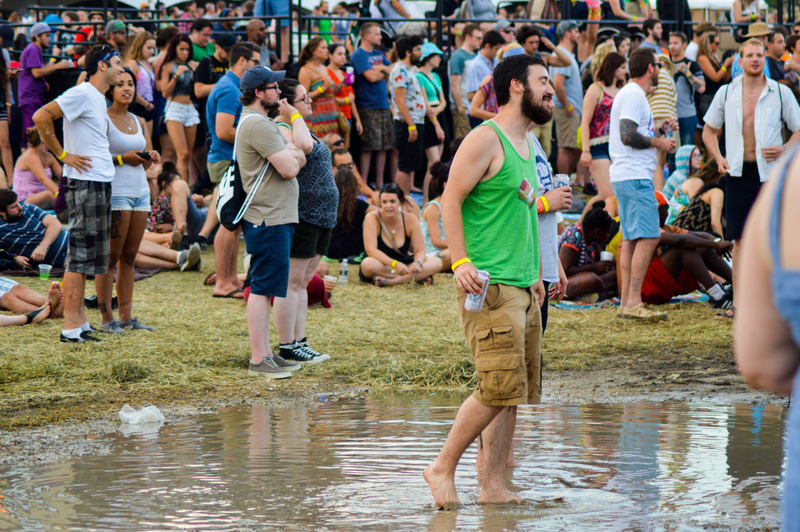 The rain left huge lakes of water scattered throughout the festival grounds. Many areas were mud free, but many festival goers took the mess as an opportunity to have some fun. People flocked to the lakes to dance, talk, and take pictures until the music started again. 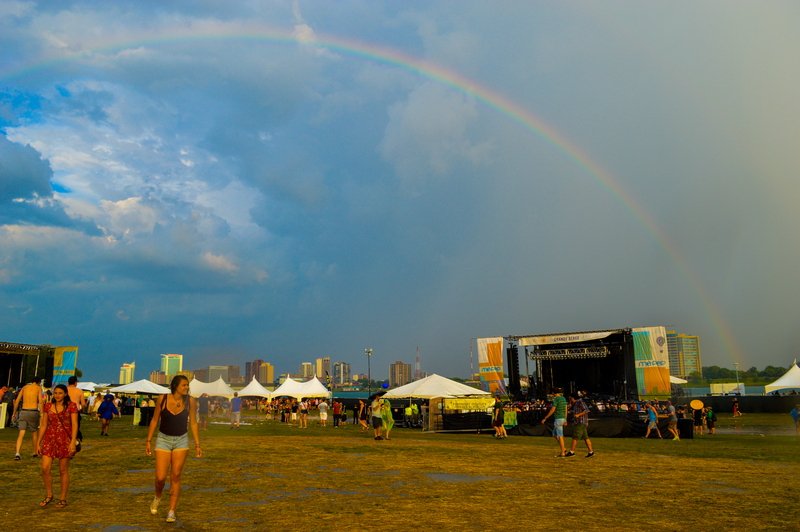 I was impressed with the festival’s ability to recover after the rainstorm of the first day. The massive lakes of rainwater that were left on the premises had all but disappeared by day two. Overnight hay was strewn across the premises to soak up water and add a layer between the mud and our feet. With the exception of a few left over pools of water, the festival grounds were in amazing condition after such an intense rainfall. Mo-Pop is very close to Mom & Pop which is how I would describe the culture of this festival. There were people of all ages from toddlers to grandparents and the atmosphere was perfect for everything in between. I would generally be skeptical of bringing my child to a music festival but with the small attendance, casual atmosphere, and the fact that kids under 6 are free to enter.. I think it would make for a good bonding experience with a responsible parent. The core of Mo-Pop is provided entirely by Detroit based businesses. 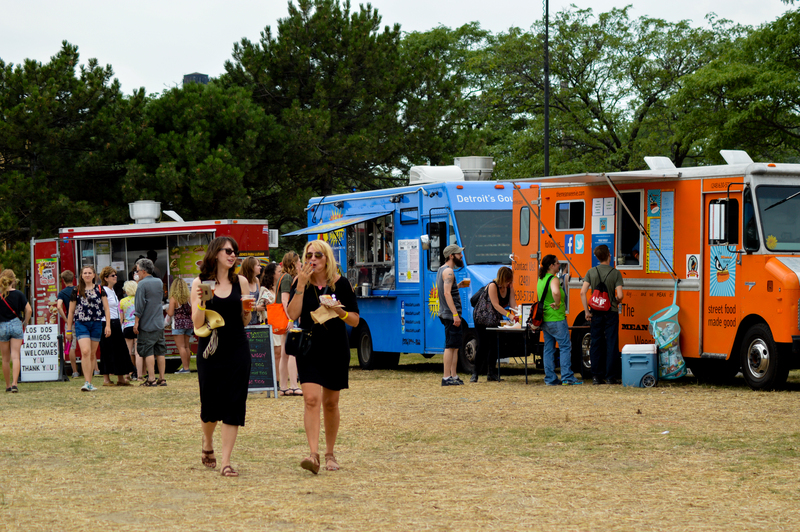 The food trucks, craft vendors, artists, and tech showcases are all Detroit companies rather than festival suppliers which supplies that home-made satisfaction. Locally made items have character that only comes from true passion which is a huge win for festival attendees. Everything about this festival is casual and welcoming from the people attending, to the bands playing, even down to the security on duty. I made new friends in line waiting to enter the festival, under the tent waiting out the rain, and simply by just walking around with a camera and a smile. The small festival makes it really fun to mingle because unlike huge festivals I actually was able to see the people I met over and over again throughout the weekend. Mo-Pop supports creativity and artistry of all types and variety and they provide that throughout the festival property. The festival actually went the extra step and they paid artists to paint on location throughout the festival. 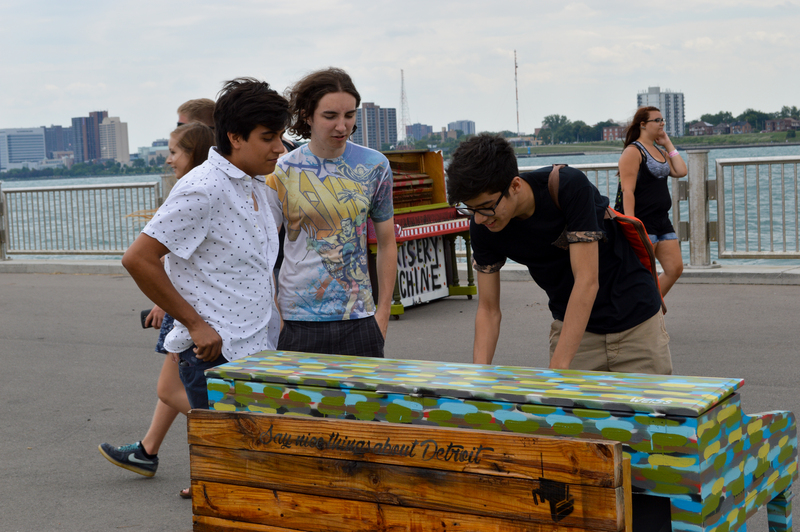 The weekend began with artists painting pianos at several locations throughout the RiverWalk. The painted pianos were a huge hit throughout the weekend as festival goers would stop for pictures, conversation, and some musical improve when the inspiration struck. There was also a spray painted van decorated on sight and an artist called Fast Eddy who painted and repainted the same sections of wall all weekend. Mo-Pop is a small music festival and because of that it only offers two stages. Each of the stages sit pointing towards a central field. The stages never overlap time slots so they alternate artists allowing for a unique experience where festival goers can find a spot in the grass, get comfortable on a blanket, and enjoy music all day from one spot. The alternating time slots give the audience the option to see every single performance that Mo-Pop has booked. This also means that people don’t have to run from one side of the festival grounds to the other to watch bands perform. I absolutely loved this because it can become heartbreaking for me to choose between artists I want to see if more than one plays at the same time. Throughout the weekend I spoke ecstatically about the stage setup and how excited I was to see all the bands, but many of the people I spoke with didn’t seem to be impressed. On several occasions festival attendees even told me that they don’t like that they don’t have a choice to choose between artists. The lack of selection between stages was overcome by the audience and band interaction. Mo-Pop’s low attendance count combined with the wide stages make it easy for anybody to be right up front to see their favorite performances. All the bands this year put on amazing performances and I think the small crowd connection was a huge contributing factor. Some bands are better seen from further out and there was always plenty of room to move between the crowds. The good thing is that it was nearly impossible to find a bad viewing angle on the property. 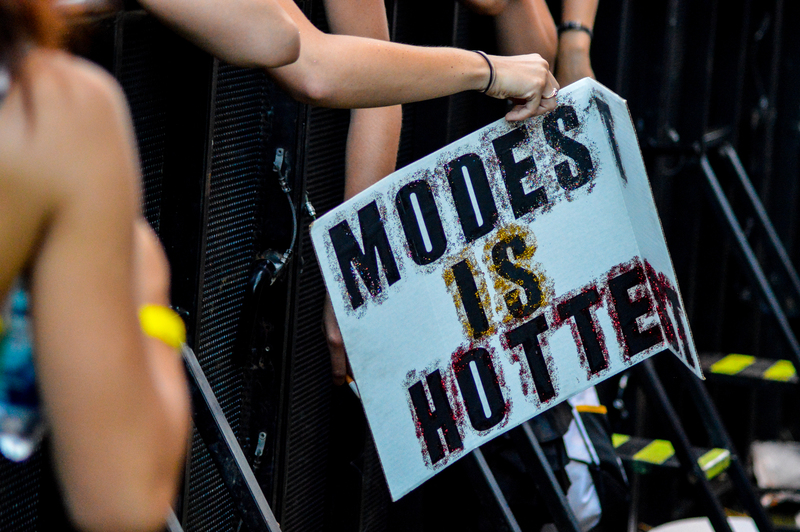 The stages themselves were pretty simple out-door stages that were decorated with Mo-Pop graphics on either side. I was impressed with how loud the stages were able to get, granted I was standing 8 feet from the speakers for most of the performances. Always wear ear protection if you want to be right up front. I did wander around the property and the music was loud enough to be heard from all corners. With only one band playing at a time it sets a good background ambiance no matter water you are doing throughout the day. Modest Mouse was the clear headliner here and everybody was excited to see the band close out the festival. I heard fans tell stories about how they have followed Modest Mouse since junior high school and how their dreams were coming true in Downtown Detroit. The band did an amazing job of providing a variety of songs both old and new and they did so in a way that was fresh and invigorating. The band talked about how they like to play the songs similar to their albums, but just a little different and improvised live. Even they don’t know how exactly they are going to play it when they go on stage. This approach translates well, it feels natural and flows well. I watched Modest Mouse perform Float on from an elevated location outside the festival and it was spectacular. James Bay is a singer/songwriter from England. He released his debut album ‘Chaos and Calm’ earlier this year in March. He has a very smooth, sultry sound with a nice uptempo feel. Women throughout the crowd were whispering before the concert about the celebrity crush they had on James Bay and after that man opened his mouth I understood why. He has a huge voice but never fails to deliver with emotion. Mo-Pop proved to be the perfect festival for the U.K. Native as he performed his hit song ‘Hold Back The River’ right in front of Detroit River. I can still picture the sailboats passing by in the background as he sang the chorus Saturday evening. 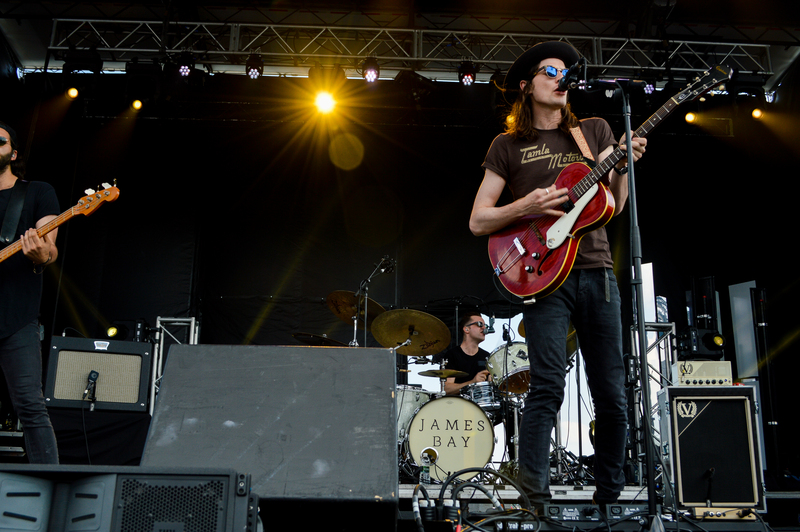 James Bay will be an impressive artist to lookout for as he settles into stardom and develops his talents further. Jeffrey Mendel consistently interacted with each other throughout their set. On several occasions Angela would run her hand through Jeffery’s hair as they would hit harmonies and perform for the crowd. Everything about their performance was very natural and it made for a performance with no dull moments. In the Valley Below gets my vote as the best performance of the weekend. Passion Pit- Unfortunate timing left Michael Angelakos, the lead singer, bed ridden with both bronchitis and pneumonia. This was horrible news and nobody can expect the front man to perform under such conditions, but that doesn’t make it any less of a bummer for fans like myself who drove hours through the night to see them perform. Iron & Wine- Now Iron & Wine really shouldn’t be on this list at all, it isn’t their fault that the sky above decided to down pour precisely when their set started. I give the band serious props for getting out during the monsoon and starting to play for their fans. Unfortunately only 20 minutes in and the band was forced to stop the set as lightning approached the area. Fans were happy to see the band but it only left them soaked and sour when Iron & Wine couldn’t continue. Chromeo- The rain really ruined Chromeo’s chances of topping the headliner list as well. Due to the spontaneous lake that formed in front of the Grande stage Chromeo was forced to change stages only an hour before they were suppose to perform. This changed what was supposed to be a full band performance to a DJ set. It was great that Chromeo was still able to perform given the circumstances, however it only left fans feeling short-changed and wanting more. Mo-Pop did an excellent job at providing a variety of quality food by enlisting Detroit based Food trucks. There was a food truck village with 15 different Detroit vendors that provided food for festival attendees which included chicken n’ waffles, tacos, brick oven pizza, mac n’ cheese, ice cream and more. The choice to use food trucks was an excellent one because they already have experience with serving crowds of people using only limited supplies. The trucks are real businesses that feed the city daily so it also brings a little taste of Detroit into the festival grounds. It’s also worth noting that food trucks require minimal setup and tear down so there is no need to build food shacks for the weekend. Shimmy Shack– Burgers, Fries, Shakes, and Nachos. All Vegan. RIVERSIDE BIERGARTEN- The Mo-Pop beer garden was packed with 12 different beer vendors and over 24 beers. Favorites like Goose Island’s 312 and New Belgium’s Flat Tire were available for $5. The real treat however came from enjoying a new beer under the massive beer tent with a view of the Detroit River. 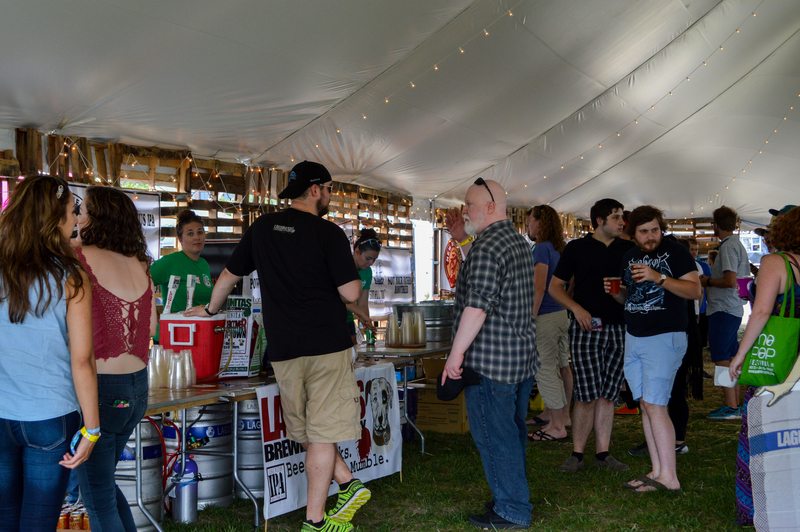 However near the end of the weekend many of the beers had been tapped out, but I’m going to attribute that to the popularity of the beers because the tent was always filled with people enjoying an ice-cold brew. Craft Bazaar- The Bazaar provided a shaded escape with unique crafts provided by twelve Detroit based craft vendors. The vendors displayed their creativity with a wide magnitude of purchasable goods. Some of my favorites included cocktail scented lip balm, zipper art that re-crafts old zippers into elaborate designs, re-purposed vinyl discs as jewelry, and tiny pocket paintings. 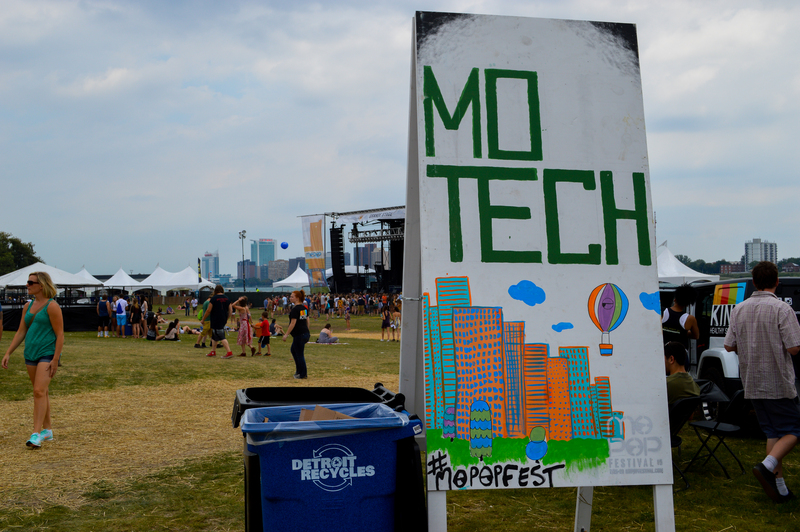 Mo Tech- The Mo-Pop Tech tent was a showcase for area inventors to display their products for festival goers. It was evident from talking to the inventors that Detroit takes its engineering seriously. My favorite products included a super lightweight, industrial strength bicycle and heavy-duty aluminum headphones that go by the name of Hear Detroit. For a little extra cash Mo-Pop offers a VIP experience with lots of nice luxuries. 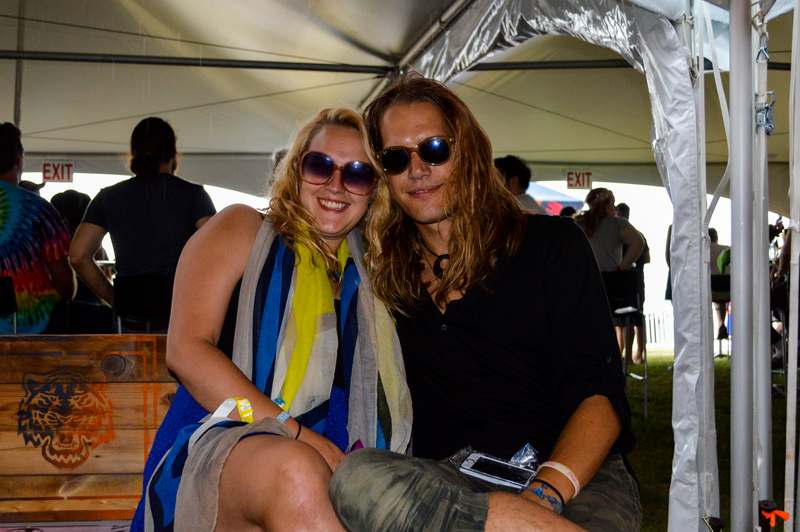 The VIP tent is located directly out from both stages which offers a perfectly shaded view of all the performances. Complete with a cash bar and a private food vendor one could spend their entire day in the VIP tent with no need to leave, but I recommend getting out and seeing all the festival has to offer. There were also tables with built-in phone chargers to keep your electronics fully juiced up. VIP also offers coaches to protect the tush from grass stains, bags to pass the time, and a souvenir gift bag. The very best VIP surprise was hands down the air-conditioned bathroom trailer. There were speakers playing music to lighten the mood, a sink to wash the stink, and just to drive the point home… the bathroom was air-conditioned!